Voters line up beside empty voting booths inside Houston's Acres Homes Multi-Service Center to cast their votes on Oct. 20, the first day of Texas' early-voting period. Due to a glitch in the electronic voting system, voters waited in long lines to be checked in manually. 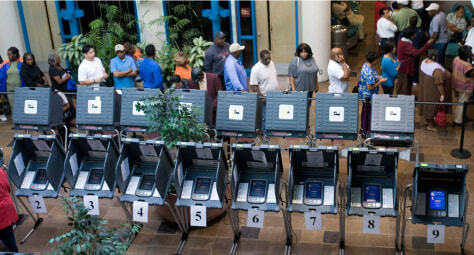 Many voters left the polling place due to the problem.